A colleague of mine brought for her birthday chocolate-dipped hazelnut cookies in the shape of triangles: they were soft, a bit crunchy, I loved them and the mix chocolate-hazelnut. 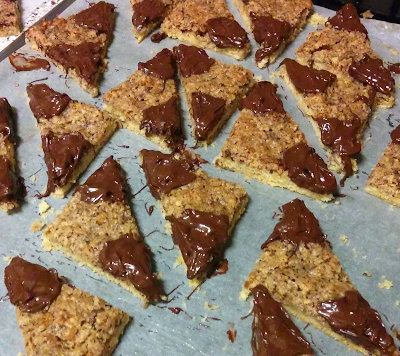 She kindly shared her recipe with me and I adapted it a bit (some more chocolate and ground hazelnuts :-p ). I also made the mistake of not letting the cookies cool down entirely before dipping them in chocolate: the first ones broke so I had to instead coat them with melted chocolate, which resulted in overall more chocolate. It tasted just as great but the cookies did look as elegant. Enjoy and thank you Jenny! In a bowl mix all ingredients for the base dough into a homogenous dough. Roll it out onto an oven-sized plate (approx 40x30cm) lined with parchment paper. Spread the apricot jam on the base dough. In a saucepan put butter, sugar, vanilla sugar and water. Heat it up until the butter melts. Add hazelnuts, mix, and let it cool down. Spread the hazelnut mix on the dough. Bake in the oven 25 min at 180 C.
Cut out triangles with about 8 cm sides (I make 8 cm squares and then cut them in two along the diagonal). Let the cookies cool down entirely (> 1 hr). 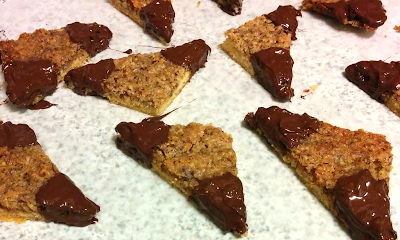 Dip both ends of the triangle in melted chocolate, let them dry, and enjoy.